Award Winning Chef Ed Zaleski of the barbecue competition team, the Carnivore’s Paradise of Romeoville, IL shared this recipe for smoked ham chops. Combine water, salt, and brown sugar in a pot and heat to dissolve. Place the pork chops in a large bowl or brining bag and add the cooled brine so the chops are completely covered. Refrigerate overnight for about 12 hours. Place in the smoker standing upright on the T-bone or in a rib rack. Smoke at 250˚ for about 2 hours or until the internal temperature is 145˚. 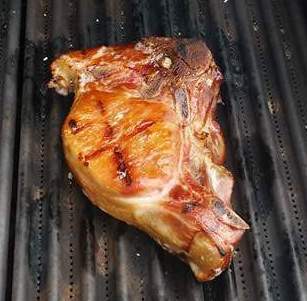 Sear over direct heat preferably using grill grates to get perfect grill marks. Glaze with Triple 9 Swine Apple Cherry glaze for salty-sweet flavor profile. More about Ed Zalenski and the Carnivore’s Paradise cook team on Who’s Cooking on a Lang! This entry was posted in Pork and tagged ham chops, pork chops by . Bookmark the permalink.